It may have been brought on by the roar of a packed-house crowd, the contagious passion from family or friends, or the moment you picked up the leather-bound, hand-stitched piece of Aussie history. The point is, there was a specific time in your past that triggered your undying love for the best sport in the world – Australian Rules Football. We’ve been directly involved with Aussie Rules for over a century, carefully crafting the balls you see at the ‘G and your local ground alike. So, take a look through our huge selection of quality Australian-made footballs – we’re sure to have exactly what you’re looking for, no matter the age group. Whether you’re restocking for yourself or passing the passion onto others, one of our locally-made AFL footballs is definitely the way to go. When the crowd’s fever reaches a crescendo and the floodlights bathe the grounds in a holy glow – what team do you most get excited to see stroll out onto that field? Red and blue, black and red, black and white? No matter your colours – watching your team emerge to do what they do best is a truly electric feeling. Naturally, you’ll want to show your allegiance in any way you can, whether it be painting your face in your team colours, decking your room out in AFL official merchandise, or purchasing an official Sherrin footy proudly sporting your club’s designs and colours. Check out our wide selection of team style synthetic and leather footballs in our online AFL shop and do your club proud! Plus, we’ve made it even easier for you to get your team’s colours in your hands – you can now shop our official AFL foot ball and merchandise range on AfterPay! When your child grows up to become a local footy super-star, or who knows, even goes on to follow in the footsteps of their idols, they’ll look back on that moment when you presented them with their very first football. As the suppliers of choice for the AFL for over 135 years, it’s only natural that you’ll want to start them off with the best – and our junior range of AFL footys really are unmatched. Our women’s footys are sized specifically for women and are the ball of choice for the AFLW. With the option of synthetic, soft-touch and leather footballs, we’ll have what you’re looking for here on our online store. When it comes to official AFL merchandise and footballs – you know you’ve come to the right place. Got your eye on a wide range of AFL balls? 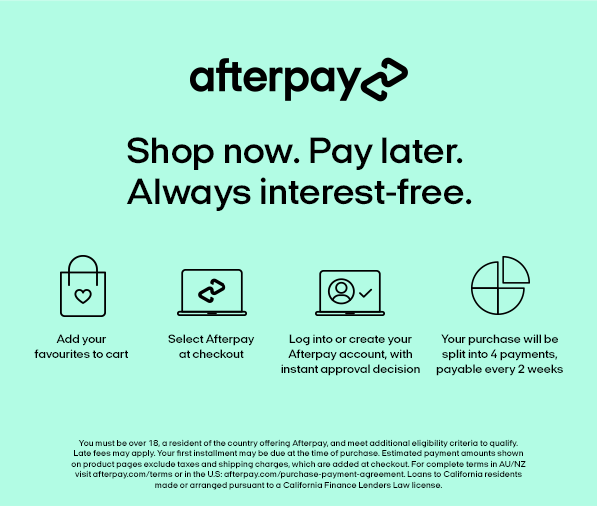 Why not AfterPay it!